My top five picks for plein air painting keep changing but this is the current favourites. The first essential is of course the easel. To be honest I have two favourites so I will count this as one. It depends on where I intent to paint and the weather conditions. 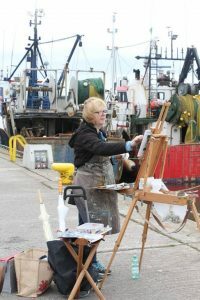 If the forecast is windy and wet then the definite favourite is my Mabel M23 which is a 1/2 french easel so half the weight and size to carry from the normal french easel. This is a very sturdy easel and has lasted me years. There are cheaper copies but they fall apart quickly. 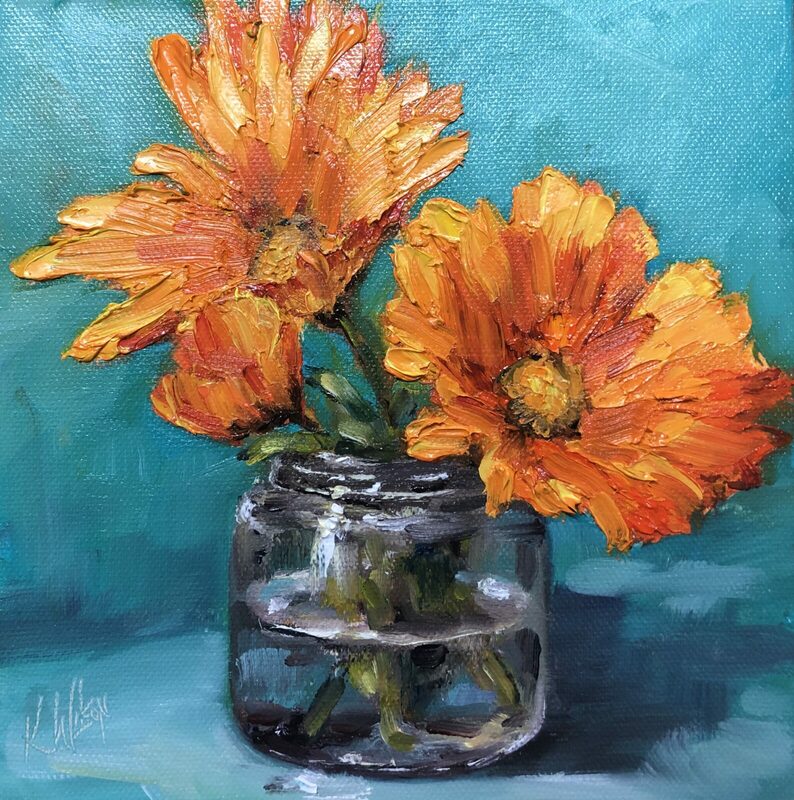 I always carry my paints separately so I don’t use the storage for paint, just brushes and palette knives. If it is windy it can easily be weighed down with a bag of sand or your backpack. 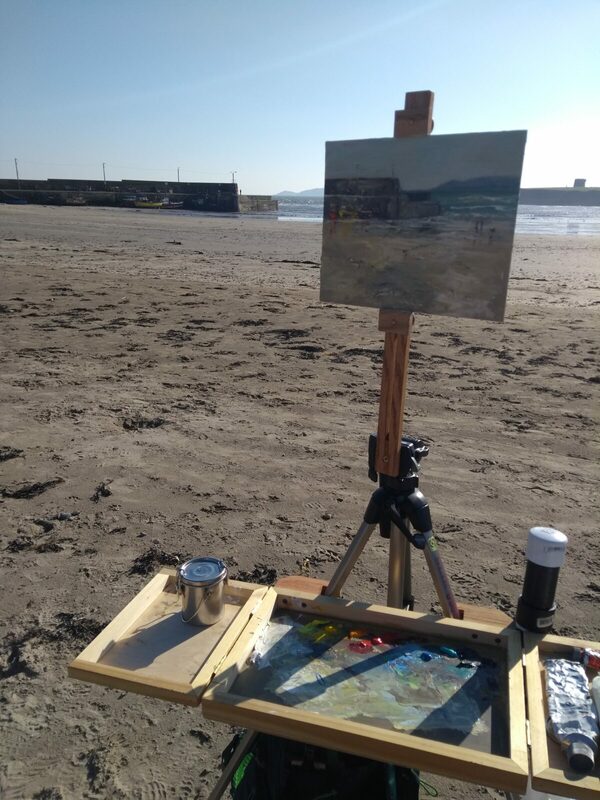 Second favourite is the Coulter plein air system. A totally different design with camera tripod as the support, a folding palette and separate panel holder. Very light and easy to move around as the palette folds over. Perfect for good weather and when you want to move from one location to another and don’t want to have to clean up paint from your palette. Unfortunately, made in the US so there are import duties, but well worth the investment I think. Watch the Youtube video below for details. Second essential piece of kit is how to carry everything, so again this is in two preferences. Firstly if I am using my french easel it is the old lady trolly bag…..ok don’t laugh…..but it is the easiest way to carry a heavy easel, paints and everything else necessary to get painting. If it is the Coulter easel I am using, then I use my Kelty Redwing backpack. (available on Amazon). This backpack has a wide opening so it is easy to slide the box, panel carrier and tripod in. I try to keep to a limited palette!! Well every artist reading this knows that there is always a few colours thrown in for luck…. My main palette is cadmium yellow, lemon yellow, cadmium red, alizarin crimson, phthalo blue, ultramarine blue and titanium white, with a few extras of yellow ochre, burnt umber, veridian and permanent rose. So not too limited!! A few brushes in different sizes. I prefer hog hair 2, 4, 6, 10 flats and a rigger size 1. For palette knives I like the Italian RGM knives and use a very large tear shaped one (sorry can’t see the number) and one size 61 which is an oval shape which is very versatile (try Jacksons UK for RGM knives). For mediums I use Liquin impasto and white spirits and cotton rags. Kept in a plastic box with snap lid, lots available in Ikea. Firstly and most importantly, FACTOR 50 SUNSCREEN, no matter what the weather and even if there is no sun, It is so important to have sunscreen on and we don’t want to look weather beaten. Wellies, raincoat and hat. I also have my paint stained body warmer which is great for keeping you warm when standing for a long time. I have fingerless gloves too if it is very cold but prefer to not to have to use them. Gaffer tape, Staple gun, viewfinder, small sketch pad, pencil, bag for rubbish, painting apron, hand mirror (for checking painting and painted faces! ), umbrella, chair, baby wipes, bottle of water, snacks (lots), flask for tea, picnic….and a few painting friends. 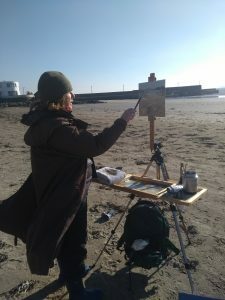 Plein air is so much more fun with company so get a few like minded artists together and go out for the day. Join a plein air group in your area. You just could not beat it! This is my list at the moment…I am sure it will change with time as everyones does, but I hope it helps anyone starting out at plein air painting.